A company branding and logo is not just a display of your company name, it also represents everything your business stands for and portrays your personality. So why would you leave your most crucial place for your business (your office) unbranded? Making a lasting impression on all visitors who enter your office, could work brilliantly in your favour. 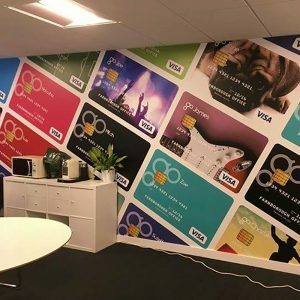 Most of the largest companies in the world are now using vinyl wall stickers to transform their offices, companies such as Facebook, Lego and Google all use Vinyl to create an energetic and lively space for their staff to work. Company slogans, motivational sayings and quotes all contribute to staff morale, reading a motivational quote every time they go to make a coffee will be sure to stick in their mind and encourage them to work harder. Wall Chimp can reproduce your company logo to any size scalable to suit your logos original size. We can work as small or as large as you require covering all aspects of Vinyl Business Logos, up to full wall murals to create an interesting creative space for staff to work. Don’t worry if you haven’t installed a wall sticker before, all of our orders come with full detailed fitting instructions to help you become a pro wall sticker installer. Removing your logo at the end of your office rental agreement could not be easier leaving no damage to the wall, so no more paying high costs to get those picture frame holes removed and repainted, just one less thing for you to worry about when moving offices in the future. Contact the Wall Chimp team at info@wallchimp.co.uk and they will get to work for you!